Across the central Gulf of California the Pacific-North America plate boundary is localized in the Ballenas channel, which separates Isla Angel de la Guarda from the Baja California Peninsula (BAJA). At about 45 mm/yr, the Ballenas Transform represents a fast moving strike-slip fault. On August 3rd a 6.9 M earthquake occurred on this fault. 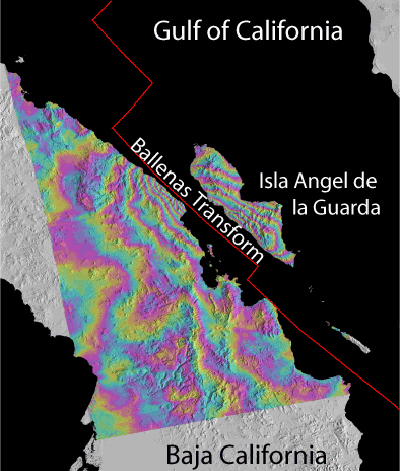 Although the epicenter of the earthquake is hidden under water, InSAR data from Envisat satellite (2004-06-24 to 2009-08-24) shows clear evidence of the coseismic deformation on mainland BAJA and Isla Angel de la Guarda (about 7-8 fringes, each with 2.8 cm line-of-sight deformation). The InSAR data is used to infer the earthquake source mechanism, using episodic GPS data to constrain the total offset across the Ballenas channel. Figure 1 - InSAR image provided by Christina Plattner, Ludwig-Maximilians University, Munich, Germany, Falk Amelung, University of Miami, InSAR Laboratory, Rocco Malservisi, Ludwig-Maximilians University, Munich, Germany, and Tim Dixon, University of Miami, InSAR Laboratory.